If it seems that I'm on a bite-sized dessert kick, that's because they make such terrific, well-received food gifts. After the fall and winter holidays, a slew of our family birthdays begin, with our celebrating most of them in March. 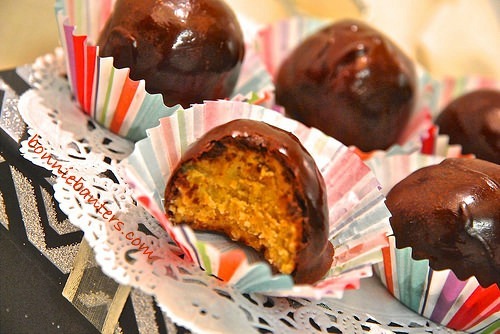 I made these fantastic peanut butter bonbons for my peanut butter-loving son-in-law's recent birthday. 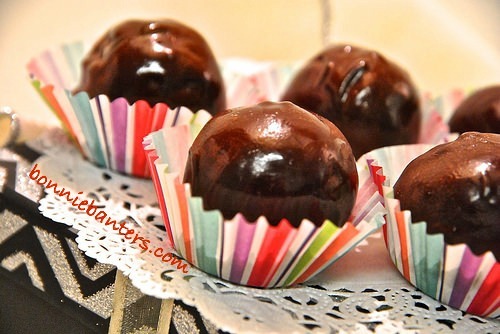 Crushed graham crackers provide a delightful surprise crunch to the creamy peanut butter center of these decadent dark chocolate-drenched bonbons. Chocolate and peanut butter...just meant to be! Line two jelly roll pans or cookie sheets with parchment paper and set aside. Mix well (I used a stand electric mixer) the graham crackers, peanut butter and melted butter in a large bowl. Add the powered sugar a little at a time, as needed for the mixture to hold together well...then chill in the fridge for about 30 minutes, or until firm. Shape the confection into 1" balls, placing onto one of the parchment paper-lined jelly roll pans or cookie sheets and return to the fridge to chill an additional 15-20 minutes. With two plastic forks, dip each peanut butter ball into the melted chocolate and tap on the edge of the bowl or pan to remove any excess chocolate. As they are dipped, place the bonbons onto the other pan lined with fresh parchment paper. Once all the bonbons have been dipped, return to the fridge to let the chocolate set. Mine set in 30 minutes; however, it could take an hour or two, per the original recipe (maybe that's dependent upon the weather, or your fridge). I have found that, though good refrigerated, these bonbons taste better at room temperature. You can keep at room temperature in a covered container for up to two weeks. To store longer, place in the freezer and let come to room temperature when ready to serve. Place the graham crackers into a gallon-sized food storage bag and crush with a mallet or rolling pin. Spray your measuring and working utensils with a butter-flavored cooking spray for easy release of the peanut butter. Melt the butter in a microwavable bowl at 30% power for about 1 minute. For a high gloss on the bonbons, lightly rub a scant amount of canola oil on the tops and sides with your finger. 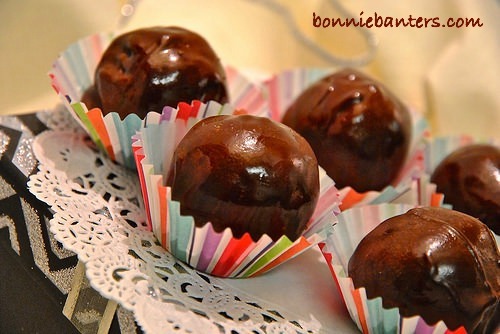 These rich dark chocolate-coated peanut butter crunchy bonbons are certain to make your heart and mouth sing...Enjoy! Hi Regina! You always bring a smile to my face...or, leave me rolling on the floor! Thank you so much, they are indeed fab! Spring here means (along with the holidays) birthdays, birthdays and more birthdays...followed by taxes!! Hope you and Ken are doing well, my friend!